This is a welcome return for the Et Ceterbeer segment and to IPA's back to my fridge. This particular IPA is from Karl Strauss brewery in San Diego, California. I don't know alot about this brewery but most beer that comes out of California is pretty good, so here's hoping this one follows the trend. Tower 10 IPA and the Red Trolley Ale, also from Karl Strauss Brewing, are recent additions to the growing Dan Murphy's craft beer section. I've never come across their beers anywhere else so it will be interesting to see the quality of this one. The one positive of it being at Dan's is that it is very cheap for an IPA at under $4 a bottle. Karl Strauss' Tower 10 IPA pours a really nice deep orange colour. The two finger head may be slightly small for an IPA but the head is nice and tight and is a brilliant white colour. It has excellent retention but it eventually settles to a moderately sized ring of foam. There is some lacing left behind but it is only above average lacing for an IPA. It's a pretty appetizing looking American IPA. Citrus and pine notes are the major elements of the nose of this beer. The hops seem to smell excellent for a Dan Murphy's IPA, which are normally stored terribly, maybe they are lifting there standards? There is lots of caramel malts up front before a grapefruit flavour takes over the beer. The hops smell nice and bitter, exactly what I'm looking for this evening. 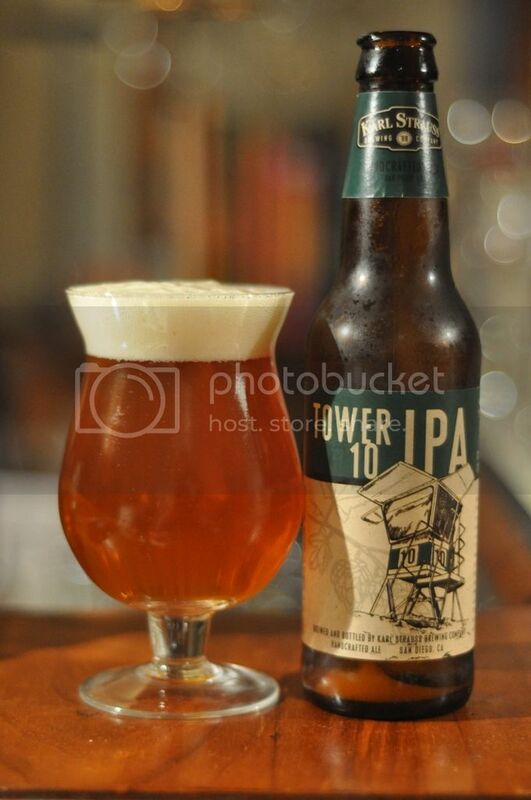 In terms of flavour the Tower 10 IPA is relatively mild by American IPA standards. Thats not to say that it isn't tasty, because it really is! It's a bit different to most American IPA's, in this one the predominant flavour is a bready/caramel malt flavour. Some strong pine hops try to take over towards the end, but the malt flavour returns toward the end with a hint of grapefruit chucked in for good measure. It's incredibly easy to drink and one I will probably buy again. This is certainly an IPA I would recommend to people wanting to get into the style. It would make a nice introductory IPA as the flavours aren't hugely confronting, but still give an insight into what a good can offer. For those who are regular IPA drinkers honestly I think it offers a bit, it's a really easy drinking IPA. I would think, at this price, this is one everyone should try.